The underground map is not to scale. That's general knowledge, but you may not understand just how not-to-scale it actually is. I'm going to use St. Paul's Cathedral as an example, but the same thing applies to other areas and destinations. 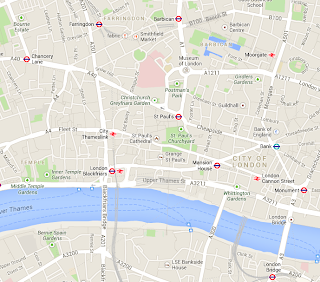 Here is an underground map of the area around St. Paul's Cathedral. Here is a Google Maps image of the same area. Obviously, St. Paul's Station is the closest one to St. Paul's Cathedral. Furthermore, every one of those stations is closer to the Cathedral than Chancery Lane Station. With that in mind, look at the Underground map again! I'm sure there are tourists who pay for an Underground ticket to ride from Farringdon to St. Paul's to go go the Cathedral. Transferring twice along the way. They probably walk as many steps as if they'd skipped the Underground and walked there in the first place. The transfer at Monument/Bank can be a hike through a maze of tunnels. Here are some similar station groups that you can easily walk between. Leicester Square, Covent Garden, Charing Cross, Embankment, and Piccadilly Circus. 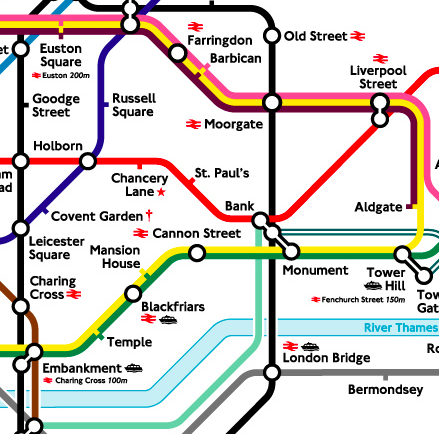 There is no need to EVER ride the underground between any of the these stations. Walk it. If the weather is nice and you don't mind walking a bit farther, this list can also include Waterloo, Westminster, Oxford Circus, Tottenham Court Road, and Holborn. Euston, Euston Square, Great Portland Street, Regents Park, Baker Street, and Marylebone are all in a line, and walkable. 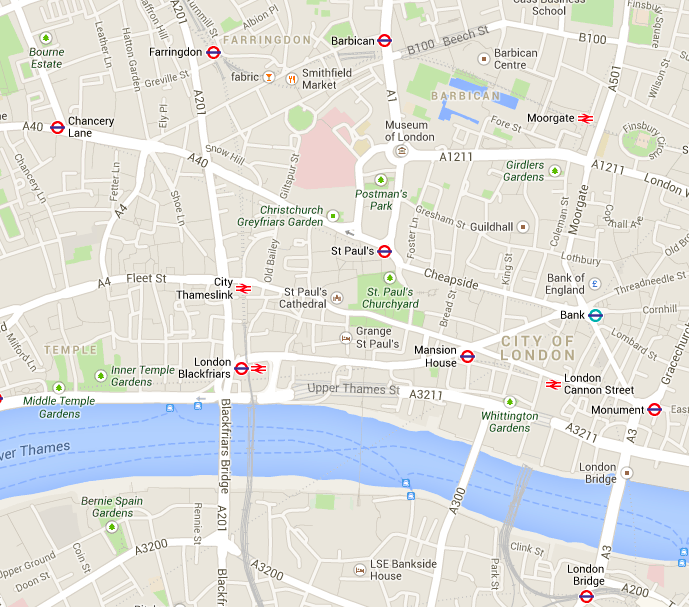 Especially Great Portland Street and Regents Park that are literally across the street from each other . King's Cross are St. Pancras not too far off to one side of that line. And Edgeware Road and Paddington not too far off the other side. St. James Park, Victoria, Hyde Park Corner, or Green Park. Charing Cross (and the West End list above) is slightly farther, but you get to walk up The Mall, which may be worth it. So make sure you check a 'real' map before riding the underground too far out of your way to get the one station your guidebook recommends. You can save a lot of time by walking a little farther to avoid transferring between Underground lines.